CoreLogic chief economist Dr. Frank Nothaft says Strong Economic Growth To Propel US Housing Market in 2015. The U.S. economy is poised to grow by close to 3 percent in 2015, generating a 3- to 3.5-million-person gain in employment. This job growth, coupled with very low mortgage interest rates and some easing in credit access, is expected to propel both owner-occupant and rental housing activity this year. This heightened level of housing demand should translate to the best home sales market in eight years, a projected rise of about 5-6 percent in the national CoreLogic Home Price Index (HPI) and mortgage originations that will likely rise in 2015 compared to last year. U.S. economic growth will be buoyed by three forces in 2015. One is the halving of energy prices since last summer, with prices unlikely to jump back up this year. This price drop has the similar beneficial effect on aggregate economic performance that a tax cut would have: Both consumers and business owners have more cash left each month to spend on other goods or invest in new equipment and financial assets. Lower energy prices could boost growth by as much as 0.5 percent, even though regions of the U.S. with jobs tied to energy production will face a slowdown. 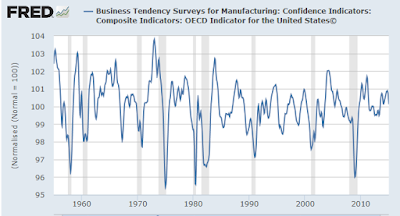 A second force at work is the rise in consumer and business manager confidence in the economic recovery. This rise has been pronounced over the past year, coinciding with the pickup in economic growth (better than 4 percent annualized growth over the last three quarters of 2014) and the drop in energy costs. 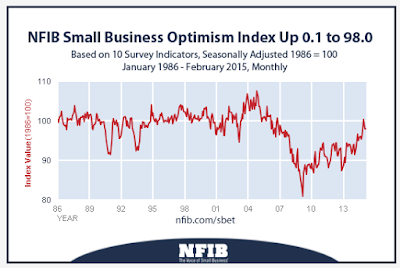 The Conference Board Consumer Confidence Index and the National Federation of Independent Business’ Small Business Optimism Index have both risen to the highest levels since before the Great Recession. Consumers who feel more financially secure are more likely to form new households and more likely to transition from rental to ownership; and businesses that are more optimistic that demand will be there for their products are more likely to hire staff. The third factor at work is a significant improvement in the budget outlook for state and local governments. With tax receipts stronger than expected, state and local governments will likely spend more, providing further stimulus to aggregate demand. With these three forces working in concert, 2015 economic growth could hit 3 percent, making this year only the second calendar year over the past decade with growth of 3 percent or better. Nothaft has his head in the sand. He ignores a massive string of bad economic reports, while focusing on the lagging influence of jobs. 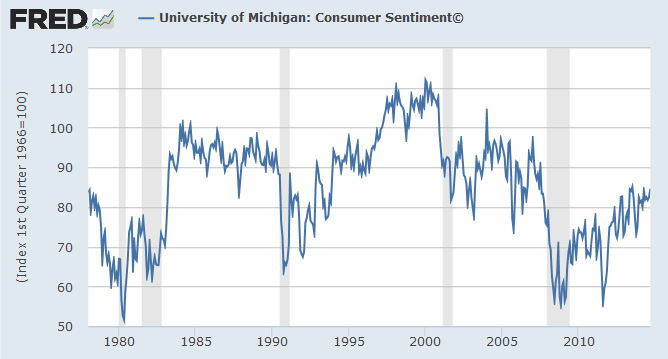 Having followed confidence numbers for years, the numbers are volatile and pretty much useless. Where are confidence numbers going from here? 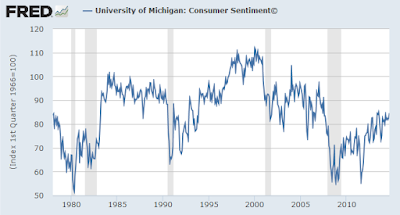 I actually suggest down because I expect a recession based on firmer data. There are all kinds of confidence indicators but how people feel at the moment is fleeting, and how confident they feel in six months is typically useless. 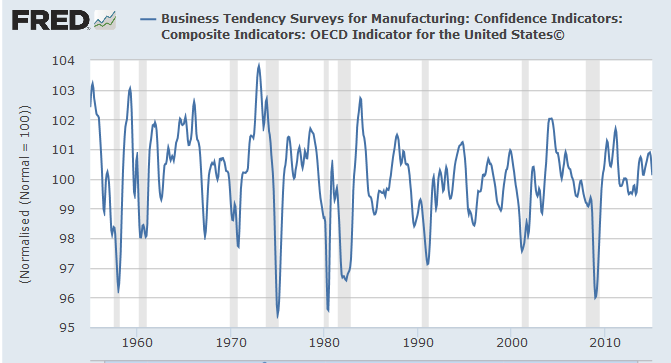 Is NFIB confidence poised to soar, plunge, or go nowhere? The latest month was a dip. Although the index is back at pre-recession levels, is the level in 2007 much of anything to brag about? China is slowing along with the global economy. The dollar has hurt US corporate profits, and productivity is declining. Local Government Spending to the Rescue? Locally, all one has to do to see the silliness of the idea that government spending will come to the rescue is look at dire state of places like Illinois and countless cities that still have not recovered from the recession (and won't). Is Chicago about ready to spend or does it want to raise taxes to make ends meet? For the answer, please see Chicago's Fiscal Freefall: Moody's Cuts Chicago Credit Rating to Two Steps Above Junk; Snake Oil and Swaps; It's All Junk Now. Also see Proposed Illinois Tax Hikes: Financial Transactions, Millionaires, Guns, Sweetened Beverages, Satellite Providers, Fireworks, Progressive Income. In short, Nothaft parrots the wisdom of the vast majority of economists who have never once in history predicted a recession.